This system is intended for Extron internal employees. Project managers, designers and developers were targeted as the main consumer of the design system. Current look and feel of our products is very different across each product. Create an internal style guide to expedite the design process by leveraging design patterns and appearance across our product inventory. 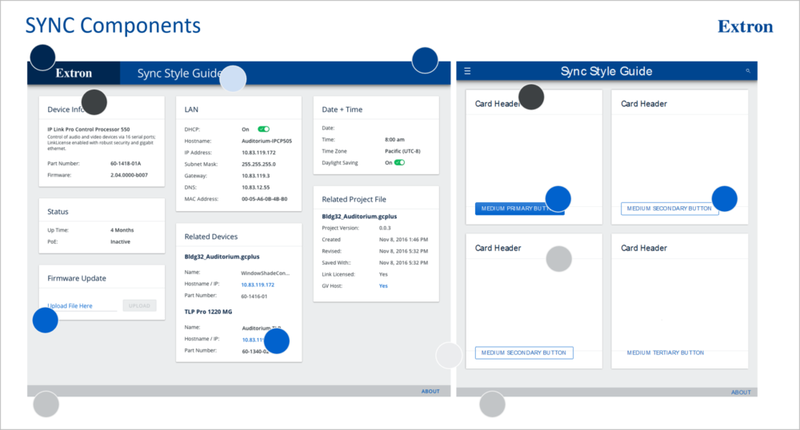 Create a style guide for members of product development so they can use styles and patterns correctly across our enterprise system. Test styles and patterns as they are created to ensure a usable experience for all of our target audiences. Provide a consistent appearance and increase brand strength. Defining the styles and color palettes to use across our ecosystem. Creating a consistent method for how a group of our designers can catelog and add guidelines to the style guide. Group reviews on acceptable patterns and styles. The UX Department audited Extron software and web products to initially understand the breadth of our offerings. Each designer defines and adds "components" or reusable styles and workflows to the design system as they naturally encounter them in the products that they support. For my part in this project, I have added components, expanded our documentation, and ran usability tests with several of the proposed designs. Showcasing how applying a design system can create consistency throughout our product line. Our style guide grows on a daily basis in terms of defining patterns for internal use and documenting these concepts for a broader Extron audience. Our UX department gains more respect and acceptance across the company with each component added or project that receives updates based on the style guide.